Headland turns and front end loader manoeuvres just got a whole lot easier with the introduction of New Holland’s Fast SteerTM system, now available on the TS-A Plus range of tractors. Fast Steer technology, which is unique to New Holland, makes turning easier. It allows the operator to turn the front wheels full-lock, while only having to move the steering wheel eight degrees to the left or right. “Farmers involved in horticultural and row crop work have really taken a shine to the five models in the TS-A range because of the versatility and exceptional power to weight ratios, coupled with an impressive 55 degree axle turn angle which gives users the control they need,” explained New Holland Marketing Manager, Simon Vigour. “Now with the introduction of Fast Steer, we expect the range to be even more popular. The Fast Steer system has been highly awarded in Europe, where it has been available for some time, taking out the 2003 EIMA Award for Innovation and the Silver Medal at Agritechnica in the same year. This system increases productivity and reduces fatigue by allowing the operator to concentrate on the task at hand, whether it is loading a trailer or making headland turns. 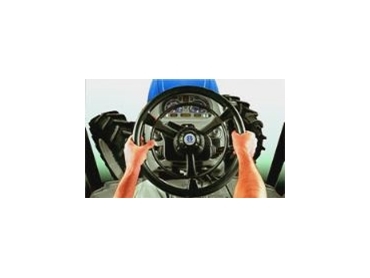 Farmers can switch between normal steering and Fast Steer as they wish and several safety features have been built into the system to prevent accidental use that may compromise on-the-job safety. “Firstly, a special inner ring must be pressed down to operate the system. Knocking the wheel for example can’t accidentally push it on. Plus, we’ve included automatic disengagement when the tractor exceeds 10km/hr or in the event of any electric or hydraulic abnormality,” Simon explained.